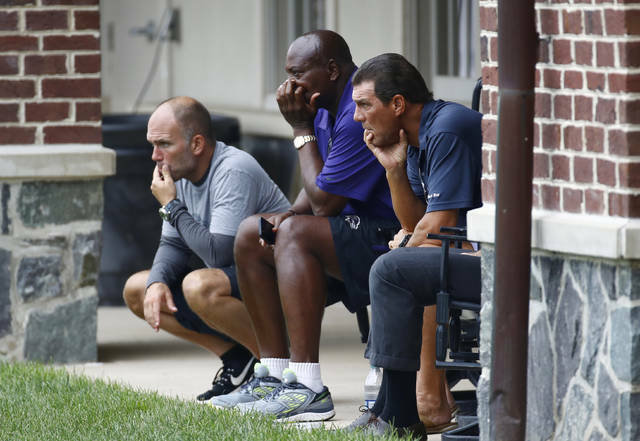 “I have size 10½ feet and I think Ozzie is a 13, so there you go,” DeCosta said Wednesday, standing alone in front of a gathering of the media and team employees at his first news conference since taking the job on Jan. 11. DeCosta was there for all of it. As an intern, DeCosta’s duties included taking then-coach Ted Marchibroda’s car for oil changes. The coach gave him $100 and told him to keep the change, so DeCosta found a place that charged $9.99. “We’ve done a lot of really good things in the past, and we would be foolish to change things overnight,” he said. The path to top coaching positions has been a rocky one for minorities. In a report Wednesday, the AP pointed out that on 2018 coaching staffs, only four minorities held the stepping-stone jobs of offensive coordinator and quarterbacks coach, just 7.1 percent of 56 jobs. That lack of minority coaches in the pipeline helped contribute to the NFL’s sharpest-ever one-year drop in minority head coaches, from eight to three, with Brian Flores soon to become the fourth when he moves from the Patriots to the Dolphins. Goodell defended the rule, which has been used in other industries, emphasizing it has opened opportunities that didn’t exist previously. “We don’t look at the success or failure of the Rooney Rule in one-year increments,” Goodell said. “We’ve had the Rooney Rule around for nearly 20 years. It has had an extraordinary impact on the NFL. Over 20 clubs have hired minority (head) coaches in that period of time. “We’re extremely pleased with the diversity, quality and the excitement surrounding our entertainers. This is the biggest stage in the world, and I know people want to be part of that. ATLANTA (AP) — James Develin will reach into his past every now and then by pulling out one of his notebooks from his junior and senior years at Brown University. The New England Patriots fullback flips through a few pages, shakes his head and can barely recognize what he scribbled on them on his way to earning a degree in mechanical engineering in 2010. That’s because the 30-year-old Develin has been fully focused on football the past nine years. More specifically, as the bruising, bulldozing fullback who smashes holes through defensive lines and powers the way for the Patriots’ running game. Develin is a bit of an anomaly in today’s NFL, playing a position that doesn’t even exist on many teams. Only 14 of 32 squads regularly lined up a fullback — something that would have been unheard of up until a handful of years ago as two-back sets were common for decades. Except in places such as New England, which has used Develin on 68 snaps this postseason — a number that could represent a whole regular season’s worth for some of today’s fullbacks. “I think the fullback position has always kind of got the moniker that it’s a dying breed, that it’s kind of on its way out, but I think football is such a matchup game and things work so cyclically,” Develin said. “As defenses get smaller and try to stop the passing attack, it kind of leaves them susceptible to, with lighter, faster guys on the field, for a power running game. What Develin, who can squat 670 pounds and bench press 500, does isn’t always seen in the game stats. Taking on defensive linemen and blitzing linebackers looking to blow up plays in the backfield is the fullback’s responsibility. For Develin, that means bursting open holes for the likes of White, Sony Michel and Rex Burkhead. He thinks of himself as the “bodyguard” for the running backs. “He’s definitely our protector out there,” White said with a laugh. That’s how it is during most games for the 6-foot-3, 255-pound bruiser. He has 13 career regular-season carries for 23 yards and five touchdowns, including four this season. Develin also set a career best with 12 catches for 61 yards. He has two rushes for 5 yards in the playoffs this year, and a 9-yard catch, all while setting the tone for a Patriots running game that has averaged 165.5 yards this postseason — second only to New England’s Super Bowl opponent, the Los Angeles Rams (175.0). Not bad for Develin, who didn’t exactly take a direct route to get here. He had a few tryouts with NFL teams, but was told he wasn’t fast enough or flat-out good enough to make it as a pro. He played one game for the Oklahoma City Yard Dawgz of the Arena Football League. Develin decided to give a switch to fullback a try, and got an opportunity with the Florida Tuskers of the United Football League in 2010. He showed enough to land a spot on Cincinnati’s practice squad later that year, and was reunited with his former Tuskers coach in 2011 when Jay Gruden became the Bengals’ offensive coordinator. The following year, Develin was one of Cincinnati’s final cuts out of training camp. Then came a call from the Patriots — and he has been a valuable piece of the Tom Brady-led offense since. So, Develin will keep pounding defenders for now. And, maybe one day after his football career is long over, he’ll hit the books again. Disclosure statement: Michael Perfit receives funding from the National Science Foundation. He is affiliated with the University of Florida. For six hours on the bottom, I direct the pilot where to go and what to sample or measure using Alvin’s two remarkably agile yet strong hydraulic arms. Multiple digital still and video cameras mounted on Alvin’s external frame record our journey along the seafloor while mini voice recorders and handwritten notes document our observations. Time goes by quickly and rarely do we get everything we planned done before the pilot notes our batteries are running low and drops hundreds of pounds of iron weights to start us on our hour long transit to the surface.